This word search Easter Word Search has 13 hidden words. The subtitle of this worksheet is "Find the Easter words in this puzzle.". This word find is 15 x 22 size. Hidden words are printed on the worksheet. There are two fields 'name' and 'date' in the header of this worksheet. The hidden words are written from left to right. The hidden words are written top to bottom. 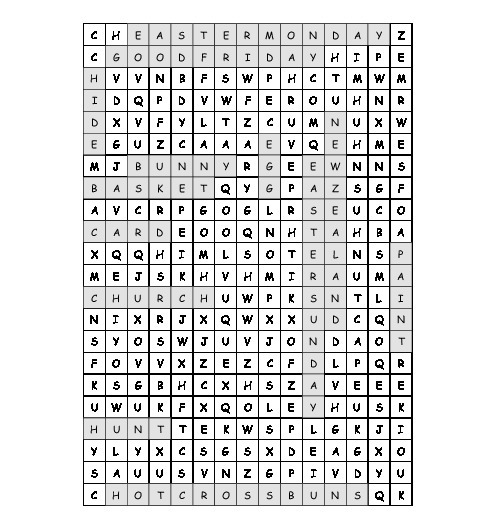 This Word Search has been checked automatically on 19th April 2019, 02:59. No errors were found. You can download this word find Easter Word Search as a worksheet (PDF, 249 kb) for free and use it in your lessons (school) or wherever you want. Are you happy with these word puzzles? Tell your friends about it! This word puzzle Easter Word Search is listed in this free Word Search Database since Sunday, 18th March 2018.